Drag 965 Pro Extreme Motorcycle low qualifier Terry Schweigert obliterated both ends of the PXM record with his 3.914-second blast at 184.58 aboard a new turbocharged motorcycle. Steve Nichols, Dan Wagner, Andy Sawyer and Terry Schweigert on the new motorcycle ready to test. Schweigert topped the final qualifying order in Pro Extreme Motorcycle for the third time this season, though for the first time, he did it aboard a turbocharged entry. 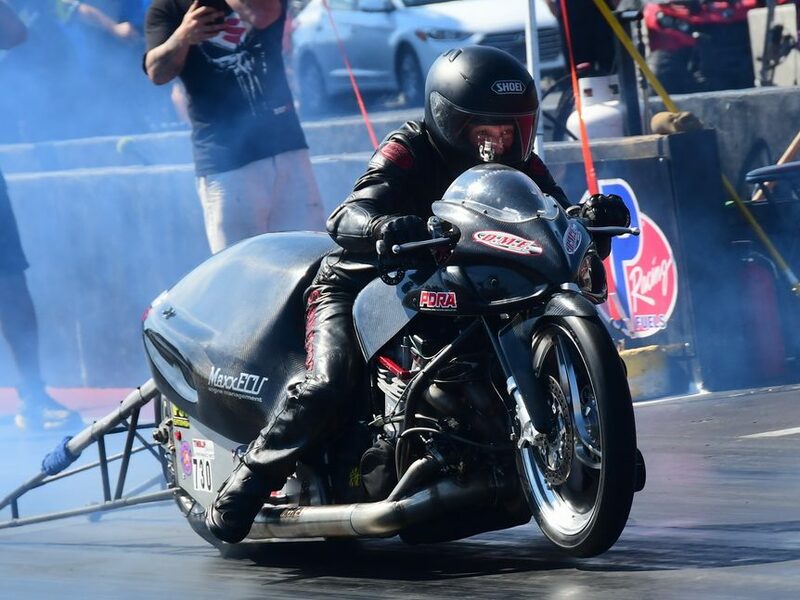 Riding a new motorcycle owned by Kevin Clark and tuned by Andy Sawyer, Dan Wagner and Steve Nichols, Schweigert rocketed to a 3.914 at 184.58 to set up two potential new records. Turbo Dragbike Goes 3.91 to the 1/8th! Schweigert will take on fellow PXM veteran T.T. Jones in the first round Saturday afternoon. Brunson Grothus on his indocil Art-backed Suzuki qualified No. 2 with a 3.998 at 177.51, followed by Spencer Allen with a career-best 4.047 at 175.23 to earn his best final qualifying position.